... she IS a deer, but I'm sure she thinks she's a goat. I've posted pictures of her before, but she's considerably closer to the house this time. And, I've decided if she's staying (and I hope she does - it's such a blessing to me to see her), she must have a name. I've chosen "Willow". Just seemed to fit. I have a yard fence between my yard and the pond - not far from my house at all. The goats like that area on the bank of the pond - even when there's no water there. She's been joining them there most days, and she's always out grazing with them. ... my pond has water and there was a pair of mallards there this morning. We used to see them all the time. Mallards, Canadian geese, even a call duck occasionally, but then the pond went dry. I told hubby he needed to get a soil test before having the pond dug, but he was sure it was okay. He chose the location because he wanted to sit on the back deck and look at it. That worked fine as long as he was alive, but the year after he died - the pond went dry. It's mostly just been a big unsightly hole in the ground since then. But, we've had a pretty wet winter and so far there's still water. So I'm thoroughly enjoying the wildlife I'm seeing again. I hope they hang around. ... well, actually it's Frosty's - but Emma Grace tries it out occasionally. 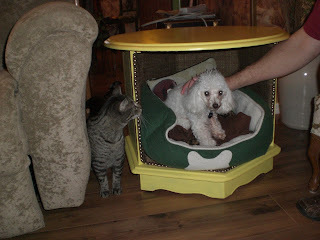 Heard Frosty barking the other day and went to see if he wanted to go outside - no, he wanted Emma Grace to get out of his bed! Please, don't ever take good health for granted. It can happen to anyone. And, if you find a lump - CHECK IT OUT. If they tell you "nothing to worry about" - GET A SECOND OPINION. ... and I love watching them. It's always such a blessing to see one. They don't come in the yard - it's totally fenced with a large dog - but they're in the pasture that's only separated from the yard by the fence. Heard the dog (big, OLD lab) barking the other morning and looked to see what he was barking at. There was a deer feeding just on the other side of the gate. She looked up, but didn't seem particularly concerned. This first picture I actually took through my bedroom window. This one I walked out on the deck. A couple of days later I was sitting on the loveseat in my living room - french doors look out into the pasture - and there was a deer grazing on grass, right in the middle of the goat herd. Obviously they get along okay. ... and I'm officially out of the furniture refinishing business. I'm TIRED of painting furniture. One table wouldn't have been so bad, but of course, I had to get carried away and do 3 pieces. Aside from the 'hunt' to find the tables (several months actually), I started the first one on January 19 and the coffee table was moved into my living room late yesterday (February 8). Almost 3 weeks. 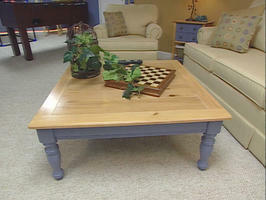 My coffee table actually has 'sage green' legs - they don't show nearly true color in the photo. I used a fabric swatch of my drapes and had the paint matched to that. 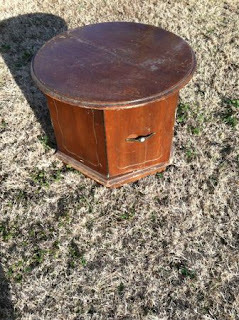 In case you missed the original post - here's what it looked like when I started... pretty ratty and scratched up - but all wood and quite solid. So, I sanded... gave it 2 coats of primer (then curing for 7 days), 3 coats of sage green on the legs and skirt, 2 coats of stain on the top, then 3 coats of polyacrylic on the top. In case you're counting - that's TEN COATS of some sort of paint, with all the waiting/curing time time between each one which means it wasn't a quick project! I don't understand how they do this kind of stuff so quickly on HGTV. Oh wait! It's TV, right? A friend, Stephanie Miller tried to post a comment on the blog and it wouldn't let her so she posted on facebook. Her ideas were 'Brownie, Cocoa, and Peanut'. Her daughter (Grace) suggested, 'Daisy, Lilly and Chip'. And son J.P. suggested 'Buck, Paisley and Avery'. Friend Rita Hayes suggested, Buster, Bahbs and Bitty. And still another friend suggested, "Little Billy" -- unfortunately that one has been used, and used and used. We actually wound up with 6 baby goats and one is kinda unusual so I'm not picking any of the above names for it (haven't sexed it yet so don't know if it's a billy or nannie. But it's about half black and half white. We had one like that years ago that Chuck named "Newsprint". I'll try and get a picture of this one this weekend. So, here's the names I selected for the original three - shown below. The one on the left is a billy, so he's 'Buster' (that's one of Rita's ideas). The little brown one in the middle is a nanny and is now Lilly (thanks Grace), I chose 'Onyx' for the solid black one - also a nanny. I've named so many goats over the years that I sort of hit a wall with these. I have found a really website (goat farm) with a ton of names. May use some of them in the future. In the meantime, thank you Rita, Stephanie, Grace and J.P. for your help!!! 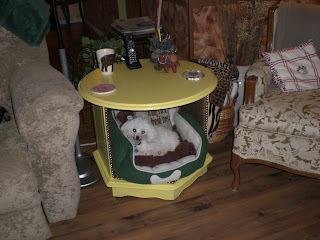 The last post with the dog bed end table turned out too long I thought, so decided to keep this table for another day. It's not nearly as exciting as the dog bed one, but it's sitting at the other end of my love seat and I think I'm gonna love it. While it's all wood, it does have laminate, so that presented a whole other challenge. I'm just hoping my paint stays on. It was really scratched and banged up, but has two drawers. Actually found this one first when I was looking for the dog bed table. 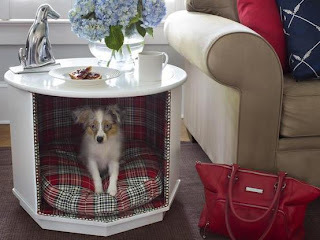 Bought it thinking if I couldn't find the one I wanted, I could remove the large drawer in the bottom and use it as the dog bed. Then found the one I really wanted and decided this one would work great at the other end of the love seat. The drawers are going to be a real bonus - I've already eliminated a lot of the clutter I had on top of my old end tables. Found it at an antique store and here's how it looked. You can see, the cats think the love seat belongs to them. 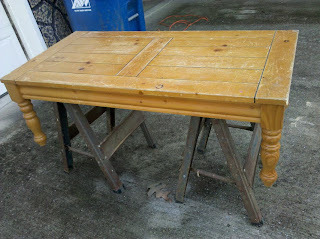 The coffee table is in the works, had it's first coat of paint on the legs today... it'll be ready soon (I hope). Both end tables are FINISHED. So, here are a couple of photos - recapping the process (which was very slow - by my standards anyway). So, here we go. 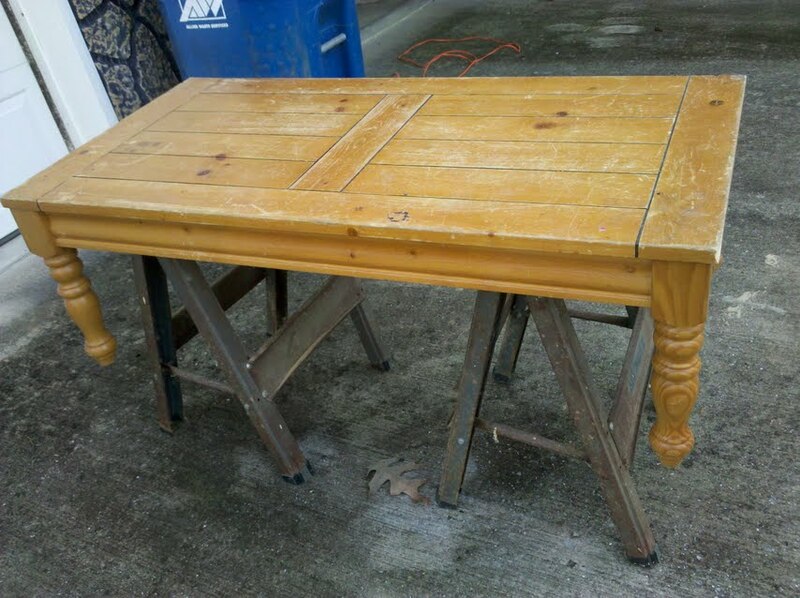 I found this ratty old table - and it was ratty. Primed with two coats of primer - let cure for 7 days, then 3 coats of yellow and then 3 coats of Minwax polycrylic on the top - which took more time and had to cure 24 hours. Interior has upholstery fabric glued with spray adhesive, and stapled inside with the nail trim finish. Emma Grace wasn't shy about trying it out. So after the last coat cured, they were FINALLY ready to use today. Instead of adding the custom cushion, I decided to simply move Frosty's existing bed inside it for the time being. Thought he might be more willing to use it with his own bed. Had to 'encourage' him at first. And, Emma Grace is still curious. I'll post the before and after of the other table in another post - it's already being used also and I'm loving the bright color. Did I mention my favorite color is yellow. Coffee table starts getting paint on Monday.